Kīlauea Volcano Summit Eruption at Halemaʻumaʻu Reaches 10th Anniversary this month! Kīlauea Volcano’s summit eruption in Halemaʻumaʻu Crater began in March 2008, marking a ten year milestone. Since that time, countless changes have occurred. 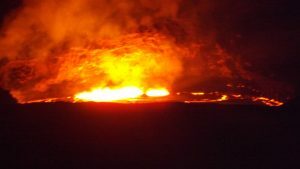 The crater enclosing the lava lake has enlarged through rockfalls, and explosions have thrown spatter around the crater and onto the rim of Halemaʻumaʻu itself. The lava-lake level has fluctuated, leading to several overflows of lava onto the Halemaʻumaʻu Crater floor.